The way mediastinal infections are developed is still a therapeutic challenge for physicians and surgeons around the globe. 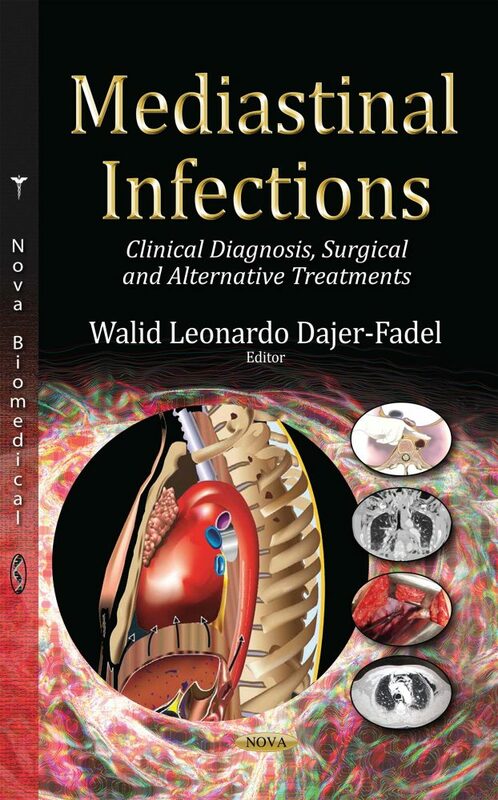 The purpose of this book is to clarify infection origins and pathways of spread to the mediastinum, and how the septic process perpetuates under different circumstances with up to date evidence based on diagnostic criteria and management protocols. A substantial thorough review of the different types of mediastinal infections are discussed, such as descending necrotizing, ascending necrotizing, post-operative, and chronic fibrosing mediastinitis, all demonstrated by diagnostic imaging and illustrations that describe surgical techniques in a step by step approach. It is intended for cardiac and thoracic surgeons, pneumologists, radiologists, infectologists and intensive care physicians as a guide based on the most recent literature, serves as a revised compendium for this rare type of infectious entity. The initial chapters elaborate in a descriptive and illustrative way the mediastinal anatomy and its pathways for dissemination from the cervical, sub-diaphragmatic and trans-sternal origins, to understand how the original infection worked its way into the spaces. This is followed by a directed review on the ensuing septic process and their management in the different mentioned clinical scenarios, each followed by a systematic approach on management, surgical and alternative treatments when applicable, to clarify the concepts explained in the various types of mediastinal infections.